Bass Connections allowed me to practice my “problem solving” skills in a real life setting, rather than a problem set on paper. It gave me the liberty to design a protocol myself rather than having one given to me. What does a typical lab look like? From my experience in high school and at Duke, a typical lab consisted of reading the lab manual beforehand, working with prearranged samples, analyzing the data and writing the lab report. It was a streamlined process that I had gotten used to. Yet similar to last semester, Bass Connections surprised me with challenges I have never encountered before. The task seemed deceptively simple. In order to determine the feasibility of a campus anaerobic digester, we wanted to find the waste composition at Duke. This would enable us to determine how much waste could be put in the digester. We already knew how much compost was generated per fiscal year from Ms. Arwen Buchholz, Duke’s recycling and waste reduction coordinator. However, not all waste that is compostable is digestible; for instance, paper is great for composting but not for digesting. Therefore, we wanted to find how much of Duke’s compost would be digestible, as this number would allow us to calculate how much biogas and electricity could be generated. One of our team leaders, Dr. Jay Golden, suggested that we do a waste audit. A waste audit looks like the picture above—we take trash generated from a building and sort it into different categories. While this sounded simple, I was given the task of designing the waste audit myself. The problem: I had never done a waste audit before, nor had I heard of it until I joined Bass Connections. I started by reading pages and pages of reports on waste audits from other academic universities. I took notes about how they decided which categories to use, and what questions we were trying to answer. Also, we had to decide which building to perform the waste audit on. Since our calculations for biogas and electricity generation were going to be dependent on waste audit values, we wanted to be conservative in our estimate. It was assumed that cafeterias would have a higher food composition in their waste than academic buildings. Therefore, we chose an academic building for a conservative estimate. We decided that Environment Hall would be a good candidate since it had recycling, trash and compost bins. We contacted Ms. Buchholz again, who generously responded to my many emails with questions of her own and helpful tips. She has done waste audits numerous times before and helped us greatly with the process. 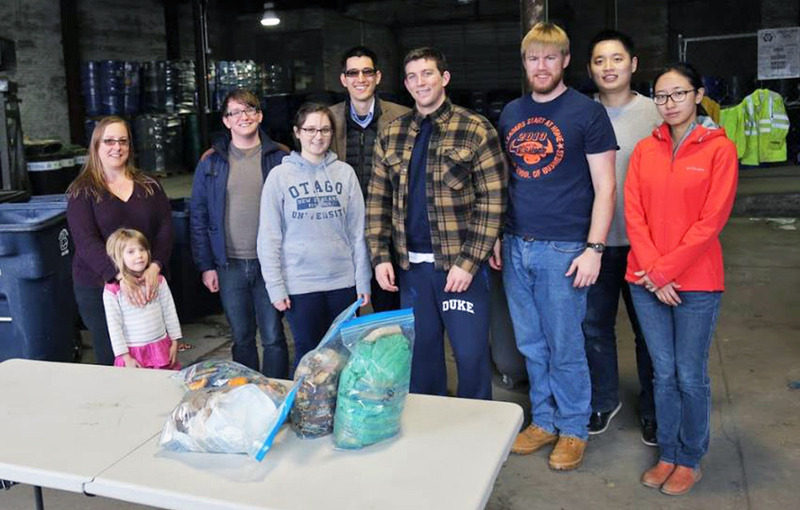 We set aside a day’s worth of trash, recycling and compost from Environment Hall, and on the big day, we all got ready in our work clothes and started tearing the bags apart. Unfortunately, I had to leave early for an exam, and therefore was not in the group picture above. For each bag, our team members noted which type of bin it came from (compost, recycling or trash). We then divided the waste into 11 different categories: newspaper/office paper/cardboard, glossy paper, soiled paper (pizza boxes, tissues, etc. ), plastic bottles, other plastics (film, Styrofoam, etc. ), glass, metals, trash, food scraps, wood/yard waste and other organics. These categories were comprehensive enough to give us a good idea of the waste composition without being too thorough, which would have taken too much time. At first, it seemed easier just to separate things into food, compost, recycling and trash. However, because some materials such as paper are both compostable and recyclable, those categories were not feasible. Hence, the categories above were chosen to allow easy calculations for recyclables, compostables, digestibles and trash. After items from each bin (or more if there wasn’t enough) were sorted, the weight of each category was measured and recorded. Surprisingly so, the trash did not smell as bad as we imagined it would. We laughed and bonded over the random objects we found. For instance, we found a love note (which, of course, was not read to protect privacy). There was a random sponge and we weren’t sure if it was organic or not. We laughed over the amount of food we found in recycling bins. We joked that we had yet to find a tear-stained paper. After a few hours, all of the trash was sorted and recorded. Our results showed that the current diversion rate for compost at Environment Hall was 22%, but the current diversion rate for recycling was 90%! The diversion rate for compost was lower because most of the paper went into recycling rather than composting. 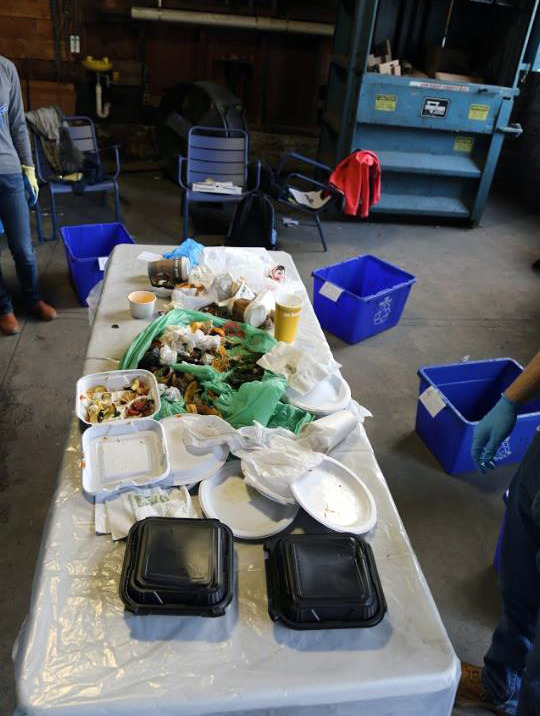 We also obtained the value that we desperately needed: about 68% of the materials found in the compost bins were digestible, and about 14% of the total trash was digestible. The waste audit was different from any other lab. I designed the procedure myself, with the help of Ms. Buchholz. I had to read about common waste audit procedures to find out what to do, rather than being told what to follow. From the waste audit, we also obtained compost samples from environment hall, which later went into biomethane potential lab, chemical oxygen demand lab and calorific value lab. These labs, as well as the waste audit, were not done in any of my classes before. I am grateful for the help of Ms. Buchholz, Dr. Deshusses, Dr. Duba and Dr. Xu for their help with the waste audit and the labs. Bass Connections allowed me to practice my “problem solving” skills in a real life setting, rather than a problem set on paper. It gave me the liberty to design a protocol myself rather than having one given to me. Being an undergraduate, it was intimidating at first to take on the role. However, I quickly learned that I must have confidence in my calculations and procedures. As an environmental engineering major, these are the types of the problems that I could encounter at work in the future, and I’m grateful that I’ve had the experience of being one of the few engineers on the team.